Dive Journal: The afternoon dive today takes us to Turtle Gardens, located just west offshore of Salt Cay and to the south. Turtle Gardens is the southernmost named dive off Salt Cay. We arrive at the mooring buoy in only a few minutes and tie-off. After the chilly experience at the Endymion yesterday, I decide to wear my dive gloves to preserve body heat a little bit, knowing that we will be diving a lot in the coming 2 weeks. After we descend, one of the Michigan divers immediately points out to me a large turtle resting beneath an overhang in the wall. I get a little bit of video, but the water is a little cloudy for a good picture. It is a relaxing wall dive, and as we crest over the wall and descend, the wonderful music of humpback whales fills our ears! This music is wide-ranging with sonorous bass notes, short tenor notes, and looping mezzo-sopranos. The enchanting music goes on during the whole dive and makes this one extra special! I’m toting my video camera this dive, but unfortunately the batteries in the monitor are shot, so I don’t ever know whether I am recording video or not. I take a chance and hope that I don’t end up with “inverted” video. Fortunately, things work out OK. There is excellent reef growth here, plenty of corals and reef fishes. There are nice banded butterflyfish, a colorful rock hind, several rock beauties, and a group of big chub above the reef. There are lots of blue chromis, and we enjoyed the sight of several large hogfish. 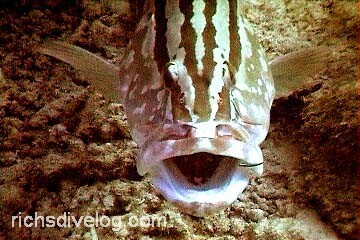 I also encounter not one but two Nassau groupers being cleaned, large friendly fish I have seen in dive magazines and fish books, but I’ve never seen before on a dive. There are several pretty rock hinds and a great stoplight parrotfish in the “initial” phase, with beautiful reds and patterned beiges. The whale songs make this dive unforgettable.